The very first version of “Tetris,” released in 1984. 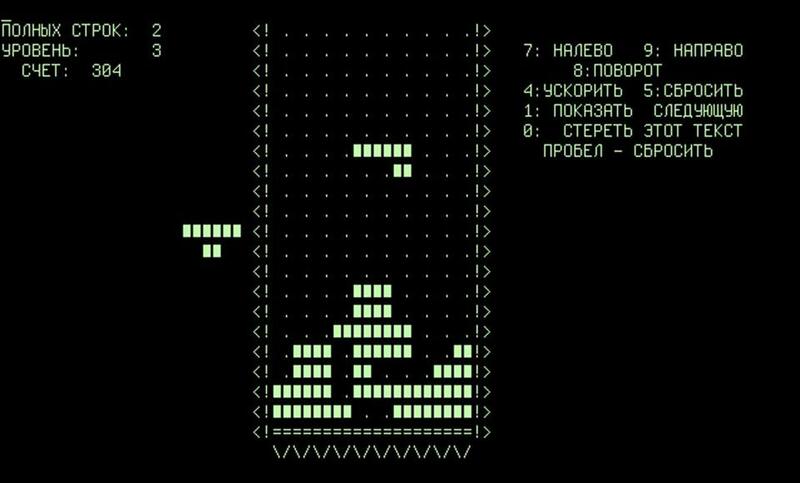 June 6 is the 32nd anniversary of the first release of the computer game “Tetris,” created by Alexey Pajitnov at the Soviet Academy of Sciences. That original version lacked sound; today, though, the game is forever associated with a particular song, an old Russian ballad called “Korobeiniki” (sometimes “Korobushka”): an unexpected stand-in for late-Cold-War Russian culture. Nintendo's Game Boy indelibly linked the song with the game; released in 1989, the device shipped with a soon-ubiquitous version of “Tetris” featuring the now-familiar arrangement of “Korobeiniki” by prolific game composer Hirokazu Tanaka. But the first commercial releases of Tetris — by Mirrorsoft and Spectrum HoloByte in the UK and US, respectively — had either original or no music. (They were also, technically, unlicensed; the early years of “Tetris” were a wilderness of unsecured rights and legal disputes.) Spectrum HoloByte's Apple IIgs version introduced “Korobeiniki” to the “Tetris” universe, albeit in a supporting role, the arrangement by a team headed by Ed Bogas (whose previous credits ranged from “Peanuts” and “Garfield” television specials to Ralph Bakshi's X-rated “Fritz the Cat”). A Japanese release, by Bullet Proof Software, made “Korobeiniki” the main theme — probably the inspiration for Nintendo's version. “Korobeiniki” (“The Peddlers”) was adapted from the 1861 poem of the same name by Nikolay Nekrasov. A young peddler meets his girlfriend in a field at night, displaying his goods with euphemistic playfulness, but the girl only takes a turquoise ring before the peddler departs to make his fortune. There the song ends, though not the poem. Nekrasov, the great, unsparing chronicler of Russian peasant life, turns the story to tragedy: The peddler is robbed and killed before he can return to his beloved. Tale and tune became embedded in Russian life; analyzing popular songs in the 1930s Soviet Union, musicologist L. N. Lebedinskii lamented that true revolutionary songs lacked the currency of favorites like “Korobeiniki” — which, with its merchant protagonist, only reinforced capitalist values. In that regard, “Korobeiniki” and “Tetris” were in ironic accord: The game's legal limbo and ultimate success made it both capitalist cautionary tale and exemplar. But “Tetris” now defines “Korobeiniki” — even melodically. The particular variant that Tanaka used, starting with a high note and a leap down, rather than a low note and a jump up, is almost never found in sources that pre-date “Tetris” (two notable recordings, by tenors Vadim Kozin and Nicolai Gedda, being rare exceptions). But after “Tetris”? The high-note version is predominant. In a phrase: game over.